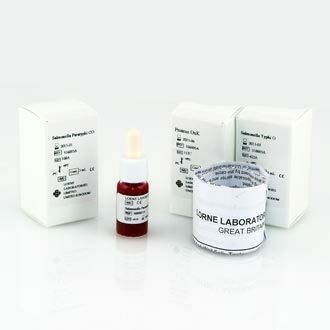 Lorne Stained Febrile Antigens are for the detection of certain Salmonella, Richettsiae and Brucellae pathogens. The antigens are suspensions of killed bacteria, stained to enhance the reading of agglutination tests. The blue stained antigens are specific to the somatic “O” antigens and the red stained antigens are specific to the flagellar “H” antigens. Suspensions of Proteus Ox2, Ox19 and OxK are used to detect Rickettsial antibodies.